Hello crafty friends! 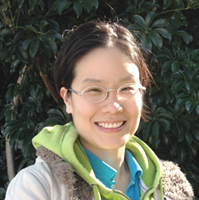 I'm Yoonsun Hur a South Korean-born Australian and I currently live in Sydney with my husband. I am still learning and enjoying true Australian culture. I love being creative!! I really love making cards with various and awesome stuff such as stamps, inks, die cuts, paper and many more. I have been working as a Graphic designer since 2000 and this career has helped me in many ways when designing cards. I endlessly want to make various attempts and share my creativity with you. 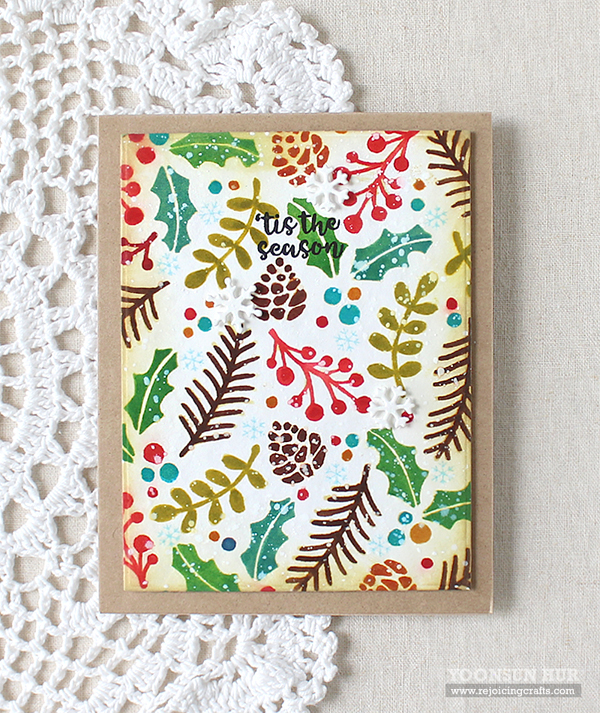 Today Yoonsun is sharing two ways to create beautiful stenciled cards featuring our Holiday Foliage Stencil. For the first card she used different colored inks on the stencil to create a fun multicolored background! She distressed the edges a bit and then added the "tis the season" sentiment from the Snow Globe Scenes Stamp Set in black over the top. She also added on a couple teeny tiny snowflakes that she cut out using the snowflake die from the Snow Globe Shaker Die Set! 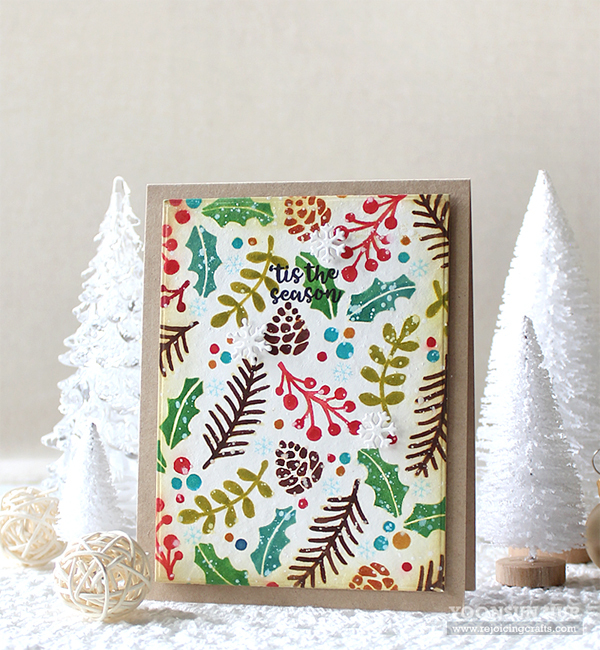 For her second card, Yoonsun also used the Holiday Foliage Stencil. This time she used white embossing paste on kraft colored cardstock to create a panel for her card. She added some pretty gold sequins and layered the "tis the season" sentiment from the Snow Globe Scenes Stamp Set in white on a little piece of red cardstock over the top. On the white card base, she also stamped a bunch of the images from the Snow Globe Scenes Stamp Set to create a fun background. 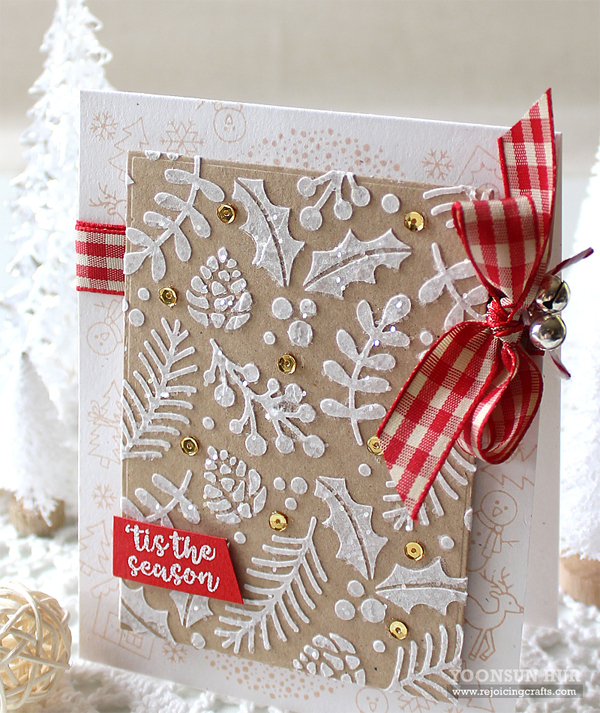 The plaid ribbon and Christmas bells give this card such a festive finishing touch! 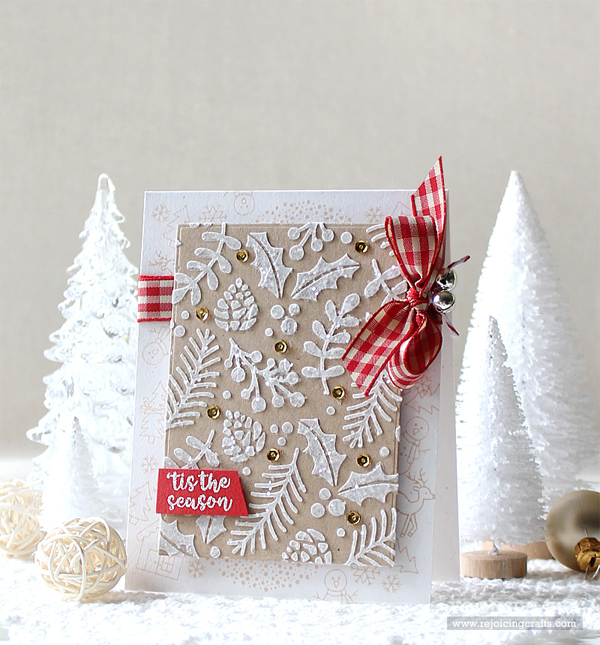 Make sure you head over to Rejoicing Crafts to get all the details on how she created this card! Thanks so much, Yoonsun for being our guest today! She will be back for our Deck the Halls with Inky Paws blog hop on Friday, December 8th. Until then, you can visit her at her blog, Rejoicing Crafts to read more about her adorable projects and say hello! LOVELY work that look so PERFECT for the holidays!!! Wow!!! Gorgeous cards! Love the vintage feel on the first one and dreamy frosty look on the second!!! Lovely cards but I love love love the white on kraft, beautiful! WOW! I always love your work (big fan here!) and these two are simpy GORGEOUS! but the first one took my breath away! Love the kraft card with the paste. I have been experimenting with it lately. Will have to try this stencil next!